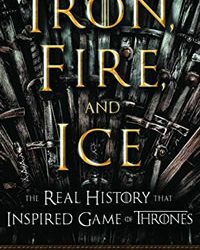 My book on the real history that inspired Game of Thrones is out in November, which I’m sure will make up for the news that The Winds of Winter won’t be. But even more exciting is that I’ve made a Spotify playlist, and I’d appreciate any suggestions. It’s a mixture of Ramin Djawadi’s soundtrack along with music relevant to the history within the book, or that is at least atmospheric. The book covers English history from the end of the medieval warm period – the star of the long winter – to Henry VIII’s execution of Anne Boleyn, with particular focus on the north, and the rivalry between the Houses of Percy and Neville. The music runs in parallel with the storyline, so after covering Edward I (the real Tywin Lannister) and the Scottish wars of independence, it focuses on northern France (the Reach) and goes back in time with Sparta and the Roman emperors. There is also a lot of Scotland (the wall as analogy for Gaelic v English-speakers) and the story of Moorish Spain (Dorne), but also Constantinople, the Crusades (I’ve included a song by Richard the Lionheart, one of two English kings listed as an artist on Spotify), the Anglo-Saxons (hence a lot of Lord of the Rings tracks, although I also just like the LOTR soundtrack), the Norman conquest (Frank Turner’s English Curse and Breme Fell at Hastings), the Mongols (I learned about Mongolian throat music through Twitter), Turks and Renaissance Italy and culminates with Henry VIII and his execution of Anne Boleyn. Henry VIII, as well as his many other talents for murder and stealing from monasteries, is also a listed artist on Spotify. Plus there’s lot of epicy-sounding music thrown in for good measure, the kind of things I imagine would accompany a medieval battle (a fantasy medieval battle obviously, not a real one, which would be accompanied by the sounds of my own terror and crying). Here’s what I think, Mr. West. I just finished reading “Vikings vs. Saxons” and my only complaint is that it wasn’t long enough! I was sorry to see it end so soon because it was not only informative but quite entertaining. I love your writing style and sense of humor. The only thing that could improve your books would be better proofreading, not for content but for duplicate words. Please write faster and keep the books coming. They’re nothing short of addictive.